Recombinant TEV Protease is a highly site-specific cysteine protease, which is found in the Tobacco Etch Virus. Due to its sequence specificity, the TEV protease is a very powerful reagent for the removal of fusion tags from recombinant proteins after protein purification. TEV Protease specifically recognizes a seven amino acid sequence of the general form Glu-X-X-Tyr-X-Gln↓ (Gly/Ser). Most commonly Glu-Asn-Leu-Tyr-Phe-Gln↓ Gly, and cleaves between glutamine and glycine or serine. Recombinant TEV Protease is a highly site-specific cysteine protease, which is found in the Tobacco Etch Virus. Due to its sequence specificity, the TEV protease is a very powerful reagent for the removal of fusion tags from recombinant proteins after protein purification. The enzyme has been genetically modified to increase its activity and resistance to autolysis. It consists of the 27 kDa catalytic domain with an N-terminal polyhistidine tag. TEV Protease specifically recognizes a seven amino acid sequence of the general form Glu-X-X-Tyr-X-Gln↓ (Gly/Ser), most commonly Glu-Asn-Leu-Tyr Phe-Gln↓ Gly, and cleaves between glutamine and glycine or serine. 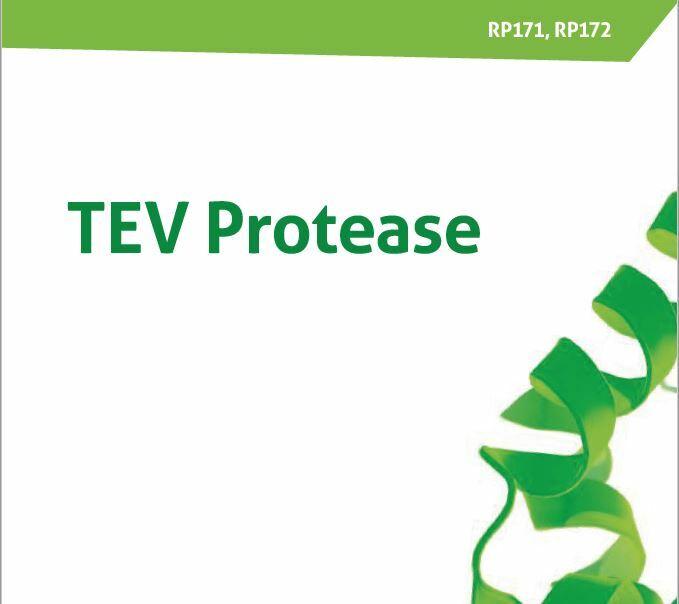 TEV Protease can also be used to cleave the affinity tag from a fusion protein immobilized on the affinity resin. Following digestion, the TEV Protease can be easily removed from the cleavage reaction by affinity chromatography using the polyhistidine tag at the N-terminus of the protease. Proteinase K from Parengyodontium album (Tritirachium album) is a subtilisin-related serine protease. It is a broad spectrum endopeptidase with very high specific activity. It is widely used for digestion of proteins, including DNases and RNases, during nucleic acid preparations without compromising integrity of isolated DNA or RNA. Proteinase K is active under wide range of reaction conditions, including elevated temperatures and presence of SDS. This recombinant enzyme is expressed in Pichia pastoris, and undergoes extensive purification to yield the highest quality product. One unit of TEV Protease cleaves > 95% of 3 μg control substrate in one hour at 30°C. If possible, perform a small-scale reaction first, to check the efficiency of the process. The efficiency of cleavage may vary due to the sequences around the cleavage site, the conformation and the solubility of the target protein. Due to its high specificity, more enzyme or longer cleavage time at higher temperature (37°C) may be used to achieve high efficiency without compromising the specificity. TEV Protease can be removed from the reaction by incubation with an appropriate nickel chelating resin to bind the His-tag (DTT and EDTA should be removed first). Follow the binding instructions for the affinity resin of choice. The cleaved protein of interest will be found in the flow-through or supernatant fraction. If the enzyme is used to remove a polyhistidine tag, this polypeptide will also be removed from the reaction. All components should be stored at -20°C. The buffer can be kept at +4° for short-term storage. The enzyme is functionally tested for the absence of any non-specific protease activity. Electrophoretic purity over 90% (SDS-PAGE).